Lawn grubs are scarab beetles in their larval stage, the most common form being that of the Japanese Beetle, or junebug. They are typically white, gently curved, and wormlike with tiny legs near the head. 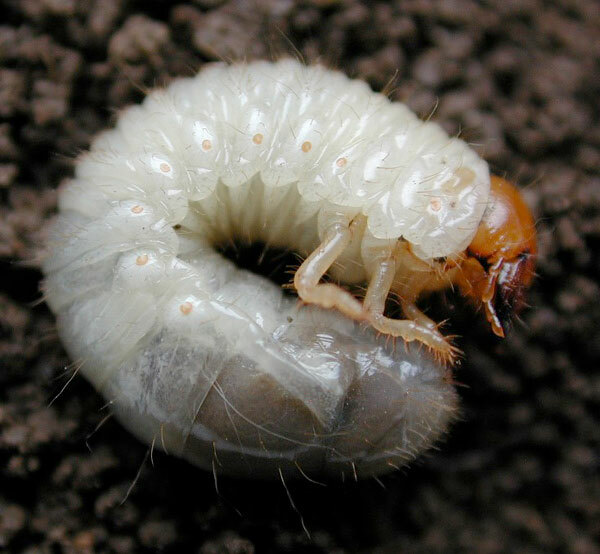 Eventually, grubs will become adult beetles, emerging from the soil to mate and lay eggs. Generally, they will likely emerge over the course of a few weeks in midsummer. Grubs feed on roots and organic material within the soil, and this can be greatly damaging to your lawn. If they’re affecting your lawn, you’ll begin seeing brown patches of grass; these can indicate entire sections of grub activity the previous fall. To be sure, lift a piece of turf; if it rolls up easily, like a carpet, that is likely because grubs have eaten away the root structure. You may also notice more frequent sightings of animals that feed on grubs: birds, skunks, raccoons and moles. And finally, you may notice that the turf in your yard has become spongy even before spotting brown patches. A healthy lawn can handle a certain number. A rule of thumb is that if 9 or more grubs are in a section of sod one foot long and two inches deep, treatment should be sought for your yard. If you have too many grubs for your own good, Good’s Tree and Lawn Care provides lawn care services including grub control. Find out more about our lawn care services here.